One of the most insidious aspects of urban sprawl is that it kills our waters. One of numerous Niagara, Ontario wooded and water areas on death row due to continued low density urban sprawl sanctioned by our municipal councils in the region. Once watersheds become urbanized, even at a level as low six per cent of the land mass, the streams within them begin to die. The aquatic biota within them become progressively less diverse, in response to pollution from road salts, automotive fluids and eroding sediment. 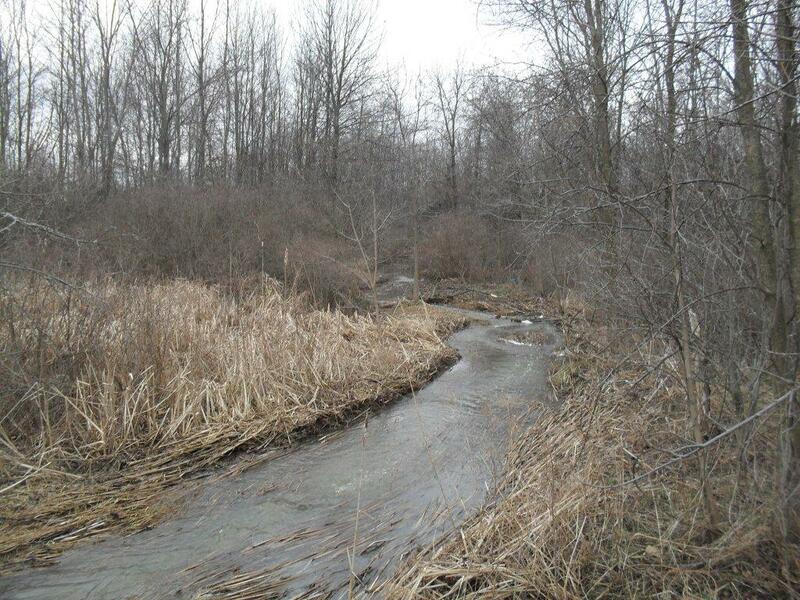 There is no healthy watershed in Ontario with streams that have been urbanized beyond the 30 per cent level. In all of Canada the most polluted stream, the Don River watershed in the Greater Toronto Area is in the heaviest urbanized watershed with over 80 percent encased in urban zoning. In the southern Greenbelt area that includes the Niagara region, there are a number of places where urbanization threaten to degrade streams. This threat is why the urban boundaries of the West Lincoln town of Smithville have been the subject of so much wheeling and dealing behind the back doors between the provincial government, developers, West Lincoln and the Niagara Region. The threat is also the worst aspect of schemes for the Airport Employment District in Hamilton, This has been the basis for disputes, meditations and Ontario Municipal Board (OMB) hearings for about 20 years. One of the most dramatic areas where water quality and urban boundaries are connected is in the City of Niagara Falls. Pollution problems here have caught the attention of veteran environmentalist, Jean Grandoni, who has seen in the course of her lifetime, urbanized watersheds such as Beaverdams and Shriners Creek turn into open sewers. Although the Ten Mile’s Creek’s flow problems have created difficulty in it maintaining fish habitat, it remains important for breeding amphibians. The stream is connected with forested vernal pool wetlands running through it, one of which a concept plan for a proposed development suggested be turned into a storm water management pond. Unlike urbanized Beaverdams and Shriners Creek, almost all of the watershed of Ten Mile Creek is on agriculturally zoned lands. To determine the impact of urbanization of water quality, Jean Grandoni worked with Professor Mike Dickman, who in 2013 was the recipient of the Niagara Region’s Lifetime Environmental Achievement Award. Dickman analyzed water the results of water sampling taken by Jean Grandoni, and analyzed by laboratories as to E. Coli counts. This is the bacterial indicator of contamination that became infamous after the Walkerton drinking water disaster, which resulted in human fatalities. Dickman also found a vivid contrast with E. Coli levels in urbanized Shriner’s Creek with that of the agriculturally zoned Ten Mile. E. Coli counts on the Ten Mile ranged from a low of 20 to a high of 180. This illustrates the enormous contrast with water quality in a forested and agricultural environment, with an urbanized area, where precipitation events routinely caused enormous sewage surcharges into surface waters. Stopping sprawl is a critical step to protecting our waters. To protect our waters come to the public consultation on the Greenbelt, which the provincial government is having on Wednesday, April 15 in St. Catharines from 6 to 9 p.m. It will be held at 327 Ontario Street, at the Holiday Inn Parkway Suites Conference Center. John Bacher is working with the Greenbelt Program team at the Sierra Club Canada Foundation and the Niagara-based citizens group, the Preservation of Agriculture Lands Society. This is another in a series on articles on the review. Later articles on the review will deal with wildlife, forests, fruitland , water pollution, the Niagara Escarpment and forests. I live within a Municipality of Niagara that has had a policy of deliberately dumping raw sewage into the creeks, that empty out into the Niagara River and they have done it for over 40 years, The Globe and Mail did an article back in the 1980s of this dumping of raw sewage into creeks, Black Creek every spring has had raw sewage dumped into it for months, at Main Street and also River Trail Black Creek Stevensville, The Town disobeyed a ruling by A.J.Chapman an OMB Judge not to allow sewage extensions to the soon to be built MOE funded sewer system, A builder who gives generously to the Mayoral campaigns has gone ahead and put in extensions (Illegal) which caused an overload of the sewer system . The Ombudsman is still waiting for Royal ascent to recently passed legislation , so that he can investigate this, complaints to the MOE have not received any responses so far. The City of Niagara Falls gets it’s water downstream from this outrage to our water supply. A Walkerton type disaster could cause the loss of Tourism and maybe deaths, if a failure were to occur at the Chippawa Water Treatment Plant. If people don’t speak up for the earth, waters, fishes, crawling things, plants, medicines, trees, animals, birds and the rest of the environment the developers will. The idea of increasing the literal amount of crap spewing into the waterways to line a few pockets is not the legacy we should be leaving for the future generations from whom we have borrowed these spaces.